The saying epitomizes the culture, everything is bigger in Texas. It might be the bravado or just tradition but the Texas gentlemen goes above and beyond to impress his guests. In the book, Entertain Like a Texas Gentleman, every man can implement these bigger than life skills. Written by David Harap, Entertain Like A Texas Gentleman gives even the most novice chef the tools to impress his guests. The sample menus are grand yet unforgettable. The key to success is the dishes themselves are easy to prepare while looking impressive. As the home cook gains confidence in his skills and can expand as he grows. The book chapters are broken into party ideas. From sports themed parties to romantic dinners, each chapter offers a variety of simple, yet impressive dishes. Instead of focusing on common, bland ingredients, this book focuses on elevated flavors in simple cooking techniques. The idea is that cooking doesn't have to be intimidating to be delicious. 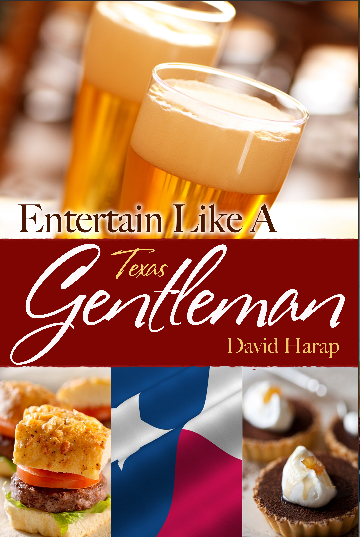 Entertain Like a Texas Gentleman would make a great gift for the guy living on his or a fun Father's Day gift. It has great insight for the novice chef and can be helpful for the more seasoned chef in a slump. I would recommend adding this book to your cooking library. The book retails for approximately $22.95 on Amazon.